Issued to the personal vehicles of County Judges. Multiple vehicles (up to 3) owned by the same judge have a letter suffix. 1932-1956: "X" prefix, dated plate. 1956-1968: "EXEMPT" undated. Silver color. Issued to all tax-exempt vehicles, except motorcycles, including those owned by federal, state & local government, schools, police, fire, etc. This is a permanent plate requiring no plate or windshield sticker. The vehicle by law must display the agency of ownership on the vehicle, but in practice this is not always so. May also be used on church trailers, EMS vehicles, privately owned school buses, etc. Plate numbers above 900-000 were made as singles and are issued to trailers, machinery, truck tractors, etc. Available as: Personalized (first issued ????) The DOT says that several personalized exempt plates have been issued, probably as special favors. First year of issue: ??? Used for passenger cars and light trucks "owned by an instrumentality established by a foreign government recognized by the United States before January 1, 1979, that is without official representation or diplomatic relations with the United States." These are used for international representatives who do not qualify for Honorary Consul plates, (namely Taiwan). For use on passenger cars and light trucks owned by persons who are honorary consuls authorized by the United States to perform consular duties. Suffix letter denotes second vehicle registered to same judge. Issued to the personal vehicles of State Judges. Multiple vehicles (up to 3) owned by the same judge have a letter suffix. 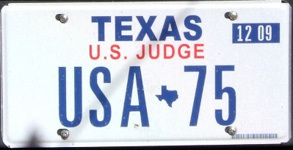 New plates are issued each year. Qualifying offices are: a justice of the supreme court; a judge of a court of appeals; a district court judge; a presiding judge of an administrative judicial district; or a statutory county court judge. Member of the legislature; the governor; the lieutenant governor; a justice of the supreme court; a judge of the court of criminal appeals; the attorney general; the Commissioner of the General Land Office; Ê the comptroller; Êa member of the Railroad Commission of Texas; the commissioner of agriculture; the secretary of state; or a member of the State Board of Education. Issued to Texas members of the US House of Representatives. Multiple vehicles owned by the same official (up to 3) have a letter suffix. Plate may be transferred to different vehicle. New plates are issued each year. Issued to Texas members of the US Senate. Multiple vehicles owned by the same official (up to 3) have a letter suffix. Plate may be transferred to different vehicle. New plates are issued each year. "Senate 3" is a sample plate, as there are only 2 senators. Issued to the personal vehicles of federal judges. Multiple vehicles (up to 3) owned by the same official have a letter suffix. New plates are issued each year. Qualifying offices are: Fifth Circuit Court of Appeals; a judge or a magistrate of a United States district court; a judge of a United States bankruptcy court.